As promised, I’m sharing more “spooktacular” halloween treats! Did you get a chance to check out the mummy cookies that I shared last week? Totally adorable and not too scary. I have to thank pinterest for always inspiring me to get creative during the holidays. There are so many fabulous halloween tricks and treats out there. Be sure to follow me on pinterest, where I’ll be sharing all of my most recent and favorite recipes! 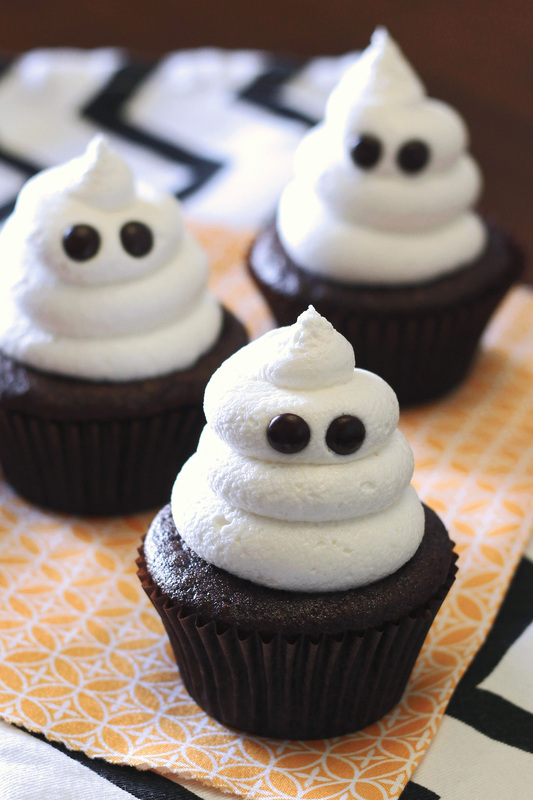 These ghost cupcakes are the easiest allergen-free halloween treat EVER. All I did was take my chocolate cupcake recipe, top with fluffy vanilla buttercream and add two chocolate eyes. I told you they were easy. 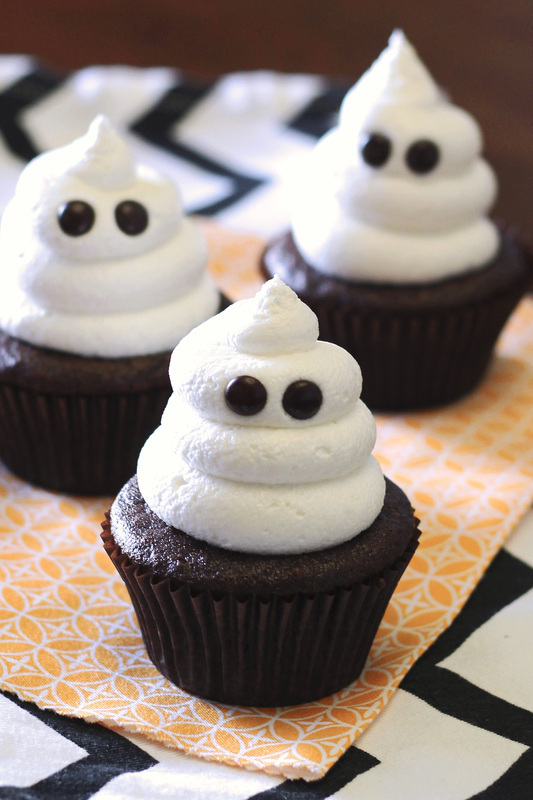 These little ghosts are far from spooky. They’re just a simple way to take a gluten free vegan cupcake from ordinary to frightfully cute! Preheat oven to 350 degrees. Line cupcake pans with paper cupcake liners. Sift together flour blend, cocoa powder, baking powder, baking soda, and salt. Set aside. In large mixing bowl, stir together coconut milk, water and vinegar, until slightly curdled. Add sugar, oil, and vanilla extract. Slowly whisk in flour mixture. Mix for 1 minute, until combined. Pour batter into prepared cupcake pan. Bake for 16-18 minutes, or until toothpick inserted in center of cupcake comes out clean. Place cupcakes on cooling rack and cool completely. To make buttercream, beat together shortening and vegan butter for 1 minute in large stand mixer. Add sifted powdered sugar, 2 tablespoons coffee creamer and vanilla. Beat for 2 minutes, until light and fluffy (add additional tablespoon coffee creamer if needed). Place buttercream in piping bag with large round tip. Pipe tall mound of frosting in center of cupcake, pulling tip away to create small peak. Add chocolate chips or candies for eyes. How do you make your frosting so white??? Whip, whip, whip! The longer you whip the frosting, the lighter it will be. 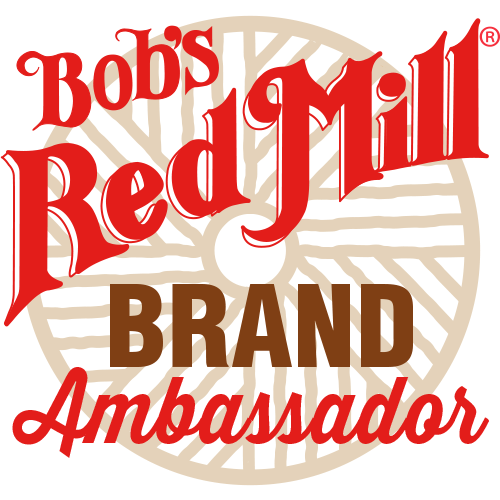 Would I be able to use coconut sugar instead of the cane sugar? For the cupcakes, you can swap out the cane sugar and use the same amount of coconut sugar in it’s place. I think that would be a wonderful (tasty) substitution! Could I replace the coconut milk with almond milk? I don’t do well with coconut. Yes, almond milk would make a great substitution for the coconut milk. Thanks for asking! So, it’s March and I made these cupcakes — although not as ghosts, as regular cupcakes with dye-free red sprinkles and two checkered flags. I’m taking them to my son’s party this afternoon. They are delicious. Slight aftertaste (I think it’s the Earth Balance, whenever I use it, there is always that same aftertaste). However, texture and taste are delicious! My son loves them. I did not tell my husband they were gluten free & vegan. He can usually tell. He didn’t comment on them “not being real” and has already eaten FOUR before the party. So, happy I found your website! It’s a total blessing. 🙂 p.s. made the dinner rolls of yours and my husband said they were really good and didn’t know they were GF/vegan either! I’ll be making those next week for Easter. Personally, I was so happy to eat both your rolls and your loaf of bread — as much as I wanted without getting sick — and believe me, I ate half a loaf in one afternoon. Yum!! I’m so glad to hear you enjoyed the cupcakes and the rolls! It always makes my day to read stories like this 🙂 Thank you for sharing! I made these chocolate cupcakes for a birthday party. I made a few adjustments though. To start, I double the tapioca starch in the flour mix instead of using corn startch. I doubled this recipe in order to make 24 Cupcakes. The batter only made 18. I used an ice cream scoop and I think it make have been more batter per pan then what Sarah does. I did 1/3 cup coconut oil (unrefined) and 1/3 cup Olive oil. I used almond milk and Apple cider vinager as well. Everything else was the same. I baked the cakes for a bit longer since they were a little bigger. They were FABULOUS to say the least. Thank you Sarah for bringing out the best baker in me. Sarah, what kind of tip do you use to get the frosting to pipe like this? Thanks! A large round tip. I’m not sure of the exact one, but it’s a pretty big round tip.